Happy Monday bookworms! I hope you all enjoyed your weekend -the week of Thanksgiving is finally upon us. I am certainly hoping to get a lot of pages read over the Thanksgiving holiday. I have been so sick lately so also hoping some additional rest will help to kick this cold to the curb! I hope the early Autumn has been treating you all a little better. Today I wanted to mention a book I finished a couple of weeks ago. 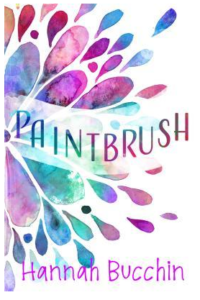 Paintbrush by Hannah Bucchin. I received this YA-Contemporary novel as the book in one of my Once Upon a Book Club boxes. The first thing I was struck by was the cover – it is absolutely beautiful. After reading the synopsis, I knew this wasn’t the kind of book that I would generally seek out for myself but I am so glad that it was included in the box. It is a coming-of-age story; a story of first love. It was well written and the characters vibrant and well imagined. I was really impressed with this young author. She should be really proud of her work here. I don’t read ‘sweet’ books a lot so it was a nice change of pace for me. The setting at Paintbrush, the living community the two main characters are a part of, seemed to take on a life of its own within the pages; it almost became one of the characters itself. If you are looking for a nice tale of young love and the tribulations that go along with that, you should definitely check this one out. This may also be a good book to gift to a young woman in your life for the Christmas holiday!